Asturian cheese of artisanal and complex elaboration for which an unusual technique of kneading the curd using the rabilar machine is used. As ancestral as its origin is its strong and somewhat spicy flavor, with the rustic aroma of the very cured butter, slightly bitter at the end of the mouth and persistent on the palate. 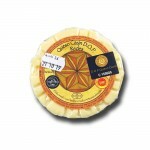 The Casín cheese is made with raw cow's milk from the native bovine race of the Asturian mountain: the cow casina. You can buy this cheese in units of 250 grams. The casin is considered one of the oldest cheeses in Spain, and even in the world, since the written testimonies referred to it go back to the 14th century. In addition, it has a peculiar form of elaboration (based on kneading the same curd several times and, preferably, only one per week), which some specialists link directly with the Neolithic and the first settlers of the Iberian Peninsula. Its age and laborious execution make it, therefore, an agri-food product of great character and strong imprint.